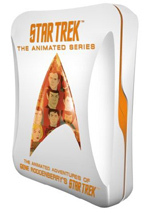 The Animated Adventures of Gene Roddenberry's Star Trek. Boldly continuing where Star Trek: The Original Series left off, these animated adventures chart the progress of Captain Kirk and his crew in a universe unconstrained by "real-life" cinematography! With all characters voiced by their original actors, join Kirk, Spock, Bones and the crew for 22 new adventures to boldly go where no animation has gone before! Just when I thought I was out, they pull me back in! After 10 movies and hundreds of live-action episodes, I thought I was finally done with new Star Trek product. Oh sure, Paramount would put out the occasional “greatest hits” compendium, but those only included programs I’d already seen – there wasn’t anything new to be found. With Star Trek: The Animated Series, I discover that I’m not finished with unreleased Trek after all. Originally aired in 1973-74, Animated lasted 22 half-hour episodes, all of which appear in this four-DVD set. I’ll examine them in the order broadcast, which is how they appear through the discs. Some aspects of Animated make it tough to dig right into the stories. Primarily, the cheap visuals and cheesy music come across as off-putting, though I’m sure I’ll get accustomed to both pretty quickly. I’ll never like those problems, but I’ll probably be able to ignore them. If “Beyond” is a harbinger of shows to come, it looks like the series will be worth the effort. Although Animated was created for Saturday morning TV, you won’t find any pandering simplicity from this episode. Indeed, “Beyond” really feels like an extension of the original series. It creates an interesting dilemma – one that foreshadows the much-maligned Star Trek V, in fact – and forms a solid show. It even maintains a Trek tradition of sympathetic “villains”, a factor that makes the episode’s ending quite haunting. “Beyond” provides a very good start to the series. This episode uses an odd timeline discrepancy as an excuse to show Spock’s childhood. That serves the show well, for the episode opens up his history in an interesting manner. The young actor who plays little Spock isn’t very good, but the program’s intriguing tale makes it worthwhile. It’s also nice to hear Mark Lenard reprise his role as Sarek. Trek always stood out from standard sci-fi in its willingness and desire to explore non-aggressive forms of resolution. “Planets” brings that focus to the forefront as it gives us an interesting view of alternate life forms. Though the show gets a little goofy when Spock mind-melds with the cloud, but this remains a generally solid show. I like the concept that Uhura gets something to do for once, but “Lorelei” suffers from too many logic problems. Frankly, the story’s something of a mess, and parts of it make little sense. This is a mediocre episode with only a few shining moments. Animated revisits the original series’ most popular moment in this adventure. Rather than simply reiterate the story from the prior episode, this one goes onto some fun tangents. It doesn’t totally reinvent the Tribble wheel, but it creates a good side story and offers more fun than usual. “Survivor” proves entertaining. It provides an interesting new species and a decent little action plot. An emphasis on brains over brawn is good most of the time, but it’s nice to get the occasional show that emphasizes adrenaline. Apparently the series’ producers couldn’t afford to hire Walter Koenig as an actor, but he did get the assignment to write this episode. I wish I could report that he offered a classic piece of Trek, but the emphasis of “Vulcan” on plant-people makes it awfully silly at times. That means that the more compelling parts falter due to the program’s inherent goofiness. At least “Megas-Tu” lets us know that the witch trials of prior centuries had a logical cause! This trippy episode mixes history with fantasy in a clever manner. It’s an unpredictable and entertaining ride. Where else will you see Captain Kirk apparently defend Satan? Another reflection of the Original Series comes here, as the episode echoes “Shore Leave”. Although it acts as another show that allows Uhura to come to the forefront, it doesn’t stand out as terribly memorable in other ways. Despite a few decent moments, this one seems lackluster. And here comes another throwback show! Harry Mudd actually showed up more than once during the run of the Original Series, a factor that made him unusual. This meant he was a good candidate for resuscitation during the Animated Series, and Harry doesn’t disappoint in this fun show. Like the Tribble programs, “Passion” gives us a playful sense of humor, and it’s nice to see Chapel get a little more to do than usual. This series’ animated format allowed for some stories that wouldn’t have worked in the live-action setting. An attempt to make all the actors tiny – or all the sets and props huge – would have been cost-prohibitive for a live-action series, but it’s not a problem at all for animation. In this case, I’m not sure that’s a good thing. On the positive side, “Terratin” takes a reasonably intelligent approach to its “little Trek” concept; it doesn’t submerge itself in goofy “everything’s so big!” nonsense. However, it has a bit more fun with that side of things than I’d like, a factor that makes the show inconsistent. It ends up as a mediocre episode. 12 shows into the series, I must admit that the cheapness of the animation is getting to me. I thought I’d become accustomed to it by now, but instead, I grow tired of the tacky visuals. This reaches a peak here since Klingon Commander Kiri looks exactly like Koloth from the tribble show. This episode highlights one of my main problems with Animated: the voice acting for new characters. The series used many of the old Trek actors in the other parts; you’ll hear James Doohan about a million times. To generate so many new characters, the performers resort to a lot of goofy voices. They sound like the kind of so-so talent you’d expect from a Saturday morning show, replete with cartoony voices and over-acting. They stand in stark contrast to the more realistic tones used for the Trek original characters. Once I get past these off-putting nuisances, “Trap” provides a pretty good show. It’s always good to find a confrontation with the Klingons, and it throws the Enterprise into a classic Trek dilemma with a seemingly impossible task. I think this is one of the more interesting Animated programs. Kirk and Spock turn into fish? This is the kind of episode I feared when I went into the Animated Series. It’s not a terrible show, but it seems goofier than most of its brethren, especially when we meet the underwater aliens; they have a very Saturday morning feel to them. This is one of the series’ weaker outings. Big cats in space suits? That’s not a pleasing sight for someone who fears the cartoony excesses that marred “Ambergris”. Despite those issues, “Slaver” manages to be interesting. The Kzinti are unusual critters, and they help make a reasonably clever tale a little more intriguing. I like “Eye” since it gives us a then-rare show that focuses almost solely on the classic Kirk/Spock/McCoy relationship. Sure, it throws them amongst many bugs and beasties, but we still get the flavor of what made that grouping so interesting. The story itself isn’t exceptional, but it’s workable and keeps us going. I won’t bother to compare “Jihad” to current world events, though the temptation exists. For the most part, the episode is a basic treasure hunt made more interesting by the presence of some unusual alien personalities. The characters added here prove more interesting than usual, especially with ballsy huntress Lara. She gives the series its only chance for Kirk to get laid, though to match the Saturday morning milieu, he passes on her charms. There’s not much to the show beyond simple adventure, but that proves sufficient. One interesting aspects of “Orion” comes from the fact that significant portions take place on another ship. That’s unusual for Animated and offers a nice twist. The episode’s actual plot is nothing surprising or innovative, but it works acceptably well. The show musters enough drama to make it watchable, and I like the depiction of Kirk’s devotion to Spock. If nothing else, the title character of “Bem” stands as one of the series’ more irritating personalities. I kept hoping Kirk would just beat the crap out of the detachable pacifist. I admit that he adds an odd spark to this interesting and unusual show, however. “Joker” throws us an intriguing concept and exploits it pretty well. The show musters a number of fun moments and ends with a typically clever solution to the Enterprise’s problem. Toss in the first-ever appearance of a holodeck and you get a solid episode. The Original series didn’t often refer to events in the crew’s lives prior to their arrival on the Enterprise, so that makes stories like “Albatross” all the more interesting. Though this episode gets a little cartoony at times, it delves into an interesting mystery. This keeps us involved in the tale and satisfies. What coincidence that the Enterprise introduces an Indian crewmember just when the story needs one! That’s just one problem with “Tooth”. In addition, it suffers from a preachy plot and weak vocal work for Kukulkan. These issues mar the program and make it less effective. Another interesting expansion of Trek lore occurs here, as we meet the first captain of the Enterprise. He’s a neat addition and gets a good role, though it’s another big coincidence that he’s there just when most needed. The program itself offers a clever tale that predates Mork from Ork’s backward aging. It also shows advantages of animation, as the format allows the characters to grow young in a much more believable manner than would have occurred with live-action actors. “Incident” ends the Animated Series on a high note. One can nit-pick Star Trek: The Animated Series, as it probably doesn’t quite compare to the Original Series. The animation is absolutely atrocious – it’s worse than even the usual Saturday morning fare – and other production elements like score and many vocal performances are weak. That said, there’s a whole lot to like about Animated. It certainly greatly excels what one would expect of Saturday morning cartoons, and the series maintains an almost shocking level of intricacy and intelligence. Clearly those behind it refused to dumb down the product for the kiddies. In addition to the intelligence of the scripts, I feel very happy that the series didn’t feel compelled to throw out cutesy kiddie elements. There’s no wacky sidekicks or adorable alien pals. Yeah, the non-human crewmembers almost become silly – mostly due to poor vocal performances – but they stay pretty straight and don’t make the series goofy. The programs boast an adherence to the tone and nature of the Original Series. And the inclusion of so many original cast members really adds to the series. Though their work as additional characters is usually weak, as their main roles, they lend a tone of credibility to the whole project. It’s too bad the producers were too cheap to hire Walter Koenig, but at least they simply dropped the character and didn’t recast Chekov. Overall, I find much more to like about Star Trek: The Animated Series than to criticize. This is pretty solid Trek and fun to watch. 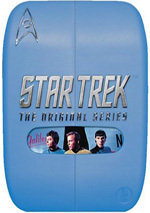 Star Trek: The Animated Series appears in an aspect ratio of 1.33:1 on these single-sided, double-layered DVDs; due to those dimensions, the image has not been enhanced for 16X9 televisions. I can’t say I expected much from 30-plus-year-old Saturday morning cartoons, so the more than satisfactory visuals here were very pleasing. Sharpness usually looked good. Some shots displayed a little softness, but those were minor concerns. Instead, much of the material was acceptably concise and well-defined. I saw no problems with jagged edges or shimmering, and edge enhancement seemed to be absent. Given the age and source of the material, print defects seemed inevitable. That said, the shows suffered from fewer than I anticipated. Occasional specks and marks popped up, but these were surprisingly minor. Actually, it became tough to differentiate between source flaws and sloppy clean-up animation. In any case, the shows looked pretty clean. Colors worked fairly well. The hues could seem a bit pale in some ways, especially given the pasty skin tones of Kirk and the other white characters. However, those issues seemed to relate to the original art, and most of the colors came across as lively and dynamic. Blacks were acceptably dense, but low-light shots seemed a little dense. These weren’t bad, but they lacked great definition. Though I went with a “B” grade for the visuals, I really thought the series looked nice. I almost gave the picture quality a “B+” but just didn’t think it was quite special enough for that mark. Though less consistent, the Dolby Digital 5.1 soundtrack of Star Trek: The Animated Series worked reasonably well for an older TV show. The soundfield didn’t open up matters to a tremendous degree, but it added some breadth. Music showed decent stereo spread, though definition of those elements seemed a bit tenuous; there wasn’t a great amount of delineation related to the instruments. Effects also used the side speakers to a moderate degree. Occasional elements popped up in those channels and we also got some movement. None of these impressed significantly, but they added to the sense of environment. As for the surrounds, they stayed with general information. Frankly, I find it tough to recall any real usage of the back speakers, as they remained passive participants much of the time. Audio quality could be iffy. Speech worked fine, at least, as the lines sounded reasonably natural and concise. I noticed crackling on other occasions, though, as effects tended to be a little rough and distorted. They showed some good bass for the louder elements, though, and often sounded good. Music lacked great dimensionality but seemed acceptable. The score accentuated the high-end and didn’t present much depth. Overall, I felt happy enough with the audio; only the crackling and distortion meant I stuck it with a “B-“. A smattering of extras flesh out the discs. We find audio commentaries for “More Tribbles, More Troubles” (DVD One), “Bem” (DVD Four) and “How Sharper Than a Serpent’s Tooth” (DVD Four). The first two come from writer David Gerrold, while “Sharper” features co-writer David Wise. They give us running, screen-specific chats for these shows. For “Tribbles”, Gerrold tells us about the story’s origins and development. He tells us how it was initially planned for the Original Series and offers other notes related to its creation and execution. We even get an interesting tale about how a fan claimed to have come up with the story. Gerrold’s chat for “Bem” covers similar topics and throws out lots of good information about the episode. As for Wise, he does just as well – and maybe even better. He chats about how he became a TV writer, his relationship with co-writer Russell Bates, many details of the story’s development, creating the episode, and other anecdotes. I especially like his funny tale about how Uhura almost called Spock a “pointy-eared fool”. Though the Wise chat is probably the best of the bunch, all three commentaries are pretty terrific. In addition, we find three text commentaries. These accompany “Yesteryear” (DVD One), “The Eye of the Beholder” (DVD Three) and “The Counter-Clock Incident” (DVD Four). As always, Michael and Denise Okuda write these components, and they offer the usual strong work. 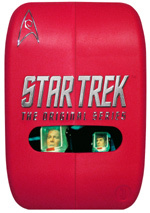 The commentaries look at the series’ development, info about cast and crew, connections to Trek before and after animated, and many episode specifics. The voice credits are especially helpful since they delineate just how many parts series regulars played; James Doohan did about 50 characters! Prior text commentaries worked well, and these continue that trend. A few Previews open DVD One. 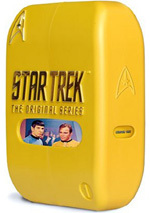 We find ads for all the various Trek series on DVD as well as for The 4400. On Disc Two, we get a Storyboard Gallery for “The Infinite Vulcan”. This offers 46 screens of art created for the episode. It presents a nice glimpse of the planning process for the series. Three additional elements pop up on DVD Four. A documentary called Drawn to the Final Frontier: The Making of Star Trek: The Animated Series runs 24 minutes and 20 seconds. It mixes show clips, archival materials, and interviews. We get notes from Gerrold, producer Lou Scheimer, director Hal Sutherland, writer/associate producer DC Fontana, writer Larry Brody, Star Trek: Enterprise writer/producer Mike Sussman, and Enterprise writers Judith and Garfield Reeves-Stevens. They discuss the origins of the Animated Series and its development, various cast and crew notes, some script and episode specifics, Gene Roddenberry’s involvement, the animation processes, visuals, and various pressures, continuity, and the show’s legacy. Inevitably, “Frontier” gets a little fluffy at times, and it doesn’t present a tremendously deep history of the series. Still, it’s good to get some insight into its workings, and we find a few nice notes here. The show offers a decent recounting of the Animated Series. Where’s the Star Trek Connection? offers a slew of mini-clips that last a total of five minutes, 44 seconds. Through 10 of these, we see links between Animated and live-action programs. It’s a good way to check out the ways that Animated fits in with the other Trek outings. A text Show History fills us in on a few topics. This brief section essentially just gives us annotated series credits. It doesn’t provide a real history and serves little purpose. Finally, a booklet adds some notes. In addition to plot synopses, it gives us some basics about the series as well as opinions about whether or not it qualifies as “canon”. When you hear about Star Trek: The Animated Series, you immediately fear the worst. Plopping the crew of the Enterprise in the midst of the miserable Saturday morning landscape of the Seventies sounded like a recipe for disaster. In truth, however, Animated offered a surprisingly effective and intelligent series. Not every episode excelled, but there’s a lot more wheat than chaff here. The DVD presents decent picture and audio along with a smattering of generally useful extras. Star Trek fans should enjoy this thoughtful and well-produced series.